Photo: Garret and Julia Gray Cottage, ca. 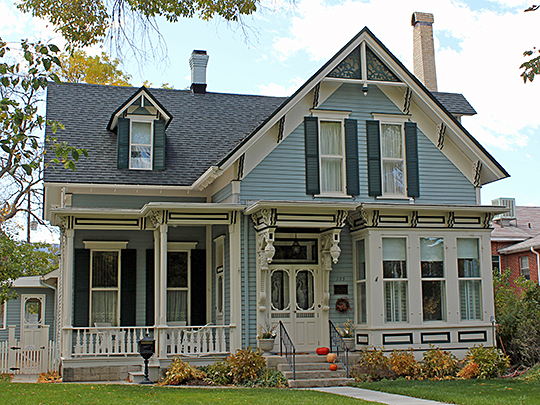 1882, 125 East 5th Street, Salida, Colorado. Listed on the National Register of Historic Places in 1980. Photographed by User:Jeffrey Beall (own work), 2011, [cc-by-3.0 (creativecommons.org/licenses/by/3.0)], via Wikimedia Commons, accessed April, 2013. Chaffee County administrative offices are located at 104 Crestone Avenue, Salida, CO 81201; phone: 719-539-2218. The county was named for Colorado's first U.S. Senator, Jerome B. Chaffee [1825-1886]. In 1928, a voter petition resulted in the removal of the county seat from Buena Vista to Salida. Jeanine Linner, President, Buena Vista Heritage, Chaffee County Courthouse and Jail, Buena Vista, CO, nomination document, 1978, National Park Service, National Register of Historic Places, Washington, D.C.